Lee: You are both retired teaching elders. How long have you been at Highland? What keeps you here? Gene: Our daughters brought us to Highland in 1984. Solid preaching kept us here. Cynthia is outstanding. I get dried up and she helps fill me back up! Lynn: Second Presbyterian was my home church. I came with Gene and my daughter (Amy Fitzgerald) and grandchildren are active. In addition to the youth ministry and worship, I stay because of the people. I find … they are genuine, biblically intelligent, theologically curious, and modest. Gene: I also like the diversity and welcome to all… something I find Highland values. I especially love it when the kids go to the front! Lee: Our 2015 stewardship theme is inspired by communion: “The Gifts of God for the People of God for the World.” What connections do you see between communion and stewardship? Gene: During communion I like to see what is given to people materialize in the world. I saw that clearly when celebrating communion in Guatemala! Lynn: [That’s true when we ask] how are we a gift of God? How should we serve? What can I do? Gene: [That’s true for] those who have gotten personally involved with welcoming refugees, those who have been readers in elementary school, and others who become the face of God for others. Lee: In the coming weeks session members and a few others will be hosting neighborhood “Conversations with Cynthia.” What do you think about gatherings like this about the present and future of Highland Pres.? Lynn: I like that we get to be with other Highland members in smaller groups. Gene: This is a marvelous idea; one I hope we do every year! Lee: You give so much of your talent to Highland, and I suspect your treasure too! What motivates you to give? Gene: I believe in the local church. If ministry is going to happen, it is going to happen there. I have Highland in my long term plans, my will, too. Lynn: Everything we have… we owe it to God. It is a pay-it-forward kind of thing. Gene: I began giving when I was in college… a little bit every week even when money was tight. I never went wanting. What I have been called to be is a good steward. I just wish I had even more resources to give! Lynn: Gene is a cheerful giver, a mindset I would like to have. I am lavish in the giving of my time and skills without charge. Gene: I carry two stones in my coin purse from times when I renewed my baptism. They help me remember my baptism, (that I am a child and gift of God)… because it is with my money I am most likely to betray my Lord. [Some churches] never ask for money. I don’t agree. I believe Highland needs to be challenged. Together, we have the capacity to give much more. Lee: Thanks for sharing your time and wisdom. You both are gifts of God for the people of God at HPC and beyond! This article is reposted from Presbyterians Today, a publication of the Presbyterian Church (USA). 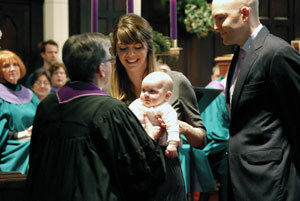 You can read it and see photos in the online version of Presbyterians Today magazine. The article is written by Linda Valentine, who is the executive director of the Presbyterian Mission Agency. An old baptismal liturgy may hold the key for understanding what it means to be Presbyterian. When my colleagues Rob and Christine Coy Fohr’s daughter, Madeline, was baptized last December at Highland Presbyterian Church in Louisville, the children of our church sang the hymn “God Claims You” (2249 in Sing the Faith). As they sang, “Madeline, Madeline, God loves you,” the sanctuary filled with love and remembrance of baptisms precious to us. They then inserted Rob’s and Christine’s names and sang to them. This hymn has become a new, deeply moving tradition for our church family, as the children join in welcoming their new friend while members of the congregation vow to nurture the child and support their parents in faith. Whether we are baptized as infants, children, or adults, it is in that profoundly gracious act that our journey of discerning and living out our Christian calling begins. For us Presbyterians, baptism is “a sign and act of God’s self-giving, by which God’s grace is made available to us” (Book of Common Worship). And our grateful response—at all ages and stages of life—is to become more and more like Christ in living out our faith. This video was made by Lucy Fitzgerald and the Children’s Sunday School classes at church. Enjoy their telling of the birth of Jesus. Thanks be to God. In the Children’s worship bulletin on Sunday, October 26, there was a prompt for our youngest to write a sermon. Lauren in the Fourth Gr ade wrote the sermon below. Thanks to Lauren for sharing her sermon with us. God always listens to our prayers. Even though millions of people are listening to music, singing, and praying all the time God listens to each and every on of us, comprehending each word, each syllable we pronounce, Even though you may not know it, you are always talking to God. Whether you are talking on a phone, or reading, or even sleeping, God is watching. If you think a bout it, you’re always doing something. Thinking, breathing, watching TV. If you are thinking, God can hear it and understands how you feel. If you watch TV, God sits beside you on the carpet and laughs at jokes. You can’t hide from God no matter how hard you try. Thanks be to God. Amen.